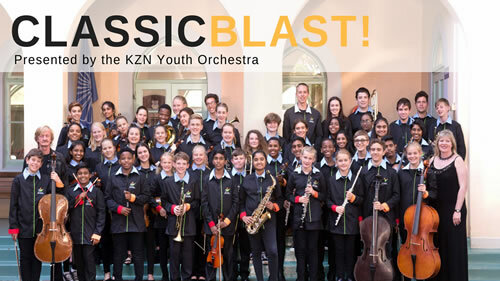 Classic Blast which was held at the 2018 Hilton Arts Festival was the first time I have seen the 51-member KZN Youth Orchestra (KZNYO) in a full concert and it was a delightful experience from beginning to end. The orchestra was conducted by Lykele Temmingh with MC Cathy Peacock, who both work closely with the KZNYO. The committed group of young players aged between 10 and 19 coming from all over KwaZulu-Natal, performed a programme of works which was constructed in four sections: Classical, Popular, Latin and African. This gave them the opportunity to play an entire range of different styles, moods and tempo from the first movement of Schubert’s “Unfinished” Symphony to Zebra Crossing made famous by the Soweto String Quartet. All sections of the orchestra were able to showcase their skills such as the heavy percussion required in Verdi’s Anvil Chorus from Il Trovatore to the sparkling section of Dance of the Hours from La Gioconda. Well-known and popular performer Bryan Hiles joined the line-up as a vocalist with numbers such as Take 5, Doo bee do; Hallelujah (sung with great sincerity and feeling) and Can’t Take my eyes off of you where he provided much amusement by interacting with Lyk Temmingh. The percussion section created appropriate animal noises for The Lion Sleeps which added to the fun.